The elections for local- and regional-authority representatives traditionally attract less attention than parliamentary elections, but can still feature vigorous battles between rivals. 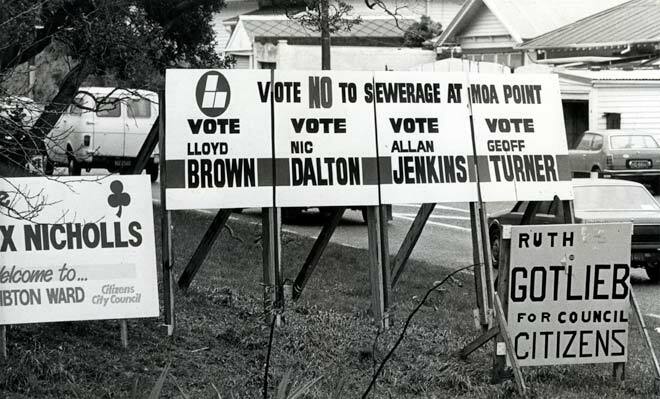 This 1986 photo of hoardings, mostly for candidates for Wellington City Council's eastern ward, shows that four candidates standing under the Labour Party banner have joined forces to deliver a joint message on sewerage works – because the maximum size of each hoarding was limited by law. The other two hoardings are for candidates standing on the Citizens and Ratepayers banner.